On the basis of responses to surface IgM (sIgM) cross-linking, B cells from 41 patients with B-chronic lymphocytic leukemia were categorized as 15 nonresponders (group I) and 26 responders (group II). The latter cases were subclassified as those seven where proliferation was induced (subgroup IIa) and the remaining 19 in whom apoptosis occurred (subgroup IIa). Signal disruption in group I was confirmed by the absence of Ca2+ mobilization. Activation of PI3K was constitutive in subgroup IIa, but not in subgroup IIb, and that of Akt induced by anti-μ in subgroup IIa, but not in subgroup IIb. Among the MAPK, ERK was more highly activated relative to p38 in subgroup IIa, whereas activation of p38 predominated over that of ERK in subgroup IIb. For subgroup IIb cells, based on tyrosine phosphorylation and translocation into lipid rafts, sIgM signaling was shown to be enhanced by Zap70. The different consequences of signaling through sIgM were associated with biological prognosis indicators. These included high levels of CD38, lack of mutations in the IgVH chain genes, preferential usage of full-length CD79b, and severe clinical stage. Thus, modification of sIgM-induced signaling could be a therapeutic approach. In contrast to other neoplasms, B-chronic lymphocytic leukemia (B-CLL) 4 is caused by dysregulated apoptosis rather than uncontrolled proliferation of tumor cells (1, 2, 3). Looking beyond this biological characterization, the clinical course of the disease has proven to be so unpredictable that the search is on now for prognosis indicators (4). Despite their accumulation in the blood, B-CLL cells do not survive in a culture. Therefore, insights into the downstream cascade of reactions are needed for the rational development of therapeutic agents that modulate the pathways transducing signals from the BCR. However, its engagement has been reported to induce such contrasting responses as prolonged survival (5, 6) and accelerated apoptosis (7, 8, 9). The propensity of malignant cells from some B-CLL patients to accelerate apoptosis in response to surface IgM (sIgM) cross-linking is associated with the expression of CD38 (8, 9, 10, 11, 12) and the lack of mutations in surface IgVH genes (10, 13, 14, 15). In contrast, B cells from other patients resist CD5-triggered apoptosis (16, 17, 18). Thus, it has become important to determine whether B-CLL, irrespective of the stimulus, can be segregated into apoptosis-sensitive and apoptosis-resistant groups and to further attempt to correlate this dichotomy with biological prognosis indicators and clinical stage of the disease. Accordingly, we have focused on the apoptotic response to ligation of the BCR. This complex consists of sIgM and the heterodimeric signal-transducing partners CD79a/CD79b. A weaker expression of these signaling molecules has been associated with a lower density of sIgM in B cells from 90% of B-CLL patients (19) and ascribed to mutations, insertions or deletions (20), and/or to alternative splicing (21). Given that the truncated (TR) variant of the CD79b transcript gives rise to a shortened isoform of the protein (22), the consequences of such an alternate splicing on the capacity of the new BCR complex to convey a message in B-CLL cells warrant additional analysis. Upon activation, a subset of BCR (23), along with other proteins involved in cell signaling, partitions into microdomains of the cell membrane, which are enriched in cholesterol and ganglioside M1 (GM1) and commonly referred to as lipid rafts (LR). We reasoned that conflicting reports on the responses of malignant cells to sIgM engagement might be due to differences in specific components of the transducing machinery. Our working hypothesis was sustained by studies, using the DNA microarray technology, and showing that, although endowed with similar phenotypes (24), different categories of B-CLL patients transcribe distinct genes, most notably those modulated in expression during BCR transduction (25). Activation with anti-μ triggers a number of protein tyrosine kinases (PTK), including four src family members, and Syk, which bears homology to the T cell Zap70. Although T cell specific, the latter PTK participates in B cell transduction in those patients (26) characterized by an inferior clinical outcome (27, 28). Further downstream, the PI3K/Akt transduction pathway prevents apoptosis (29, 30) and is activated constitutively in B-CLL cells (31, 32). Akt promotes cell survival by activating (33) conventional or novel protein kinase C (PKC) and implicating the three families of MAPK: p38 and the c-Jun NH2-terminal kinase families, which are proapoptotic, and the ERK family, which is antiapoptotic (34, 35). Once activated, phospholipase Cγ generates diacylglycerol and inositol-1,4,5-triphosphate from membrane phosphatidylinositol-4,5-biphosphate. These messengers are required for activation of PKC and release of Ca2+, respectively. MAPK are then activated by phosphorylated PKC and intracellular Ca2+, which has just been mobilized. This is reminiscent of defective Ca2+ fluxes in some B-CLL (6, 36), based on differences either in the constitutive level (37) or in the phosphorylation status of PTK (34). The present study showed that cross-linking sIgM did not induce significant changes in spontaneous apoptosis of B cells from 15 of 41 B-CLL patients. Signal transduction occurred in the remaining 26 patients, in whom apoptosis was delayed in 7 patients and accelerated in 19 patients. Reduced apoptosis was assigned to activation of Akt and ERK. In contrast, increased apoptosis was accounted for by activation of p38 and aberrant expression of Zap70, also shown to be functional in B-CLL cells, on the basis of tyrosine phosphorylation and translocation to the LR. These characteristics correlated with clinical stage and biological prognosis features, such as the expression of CD38 (38), the mutational status of IgVH genes, and the CD79b isoform used. Forty-one untreated B-CLL patients were enrolled in the study, after they had given informed consent to the institutional review board at the Brest University Medical School. All fulfilled the phenotypic criteria for the diagnosis of B-CLL (39) and were classified as grade A (16 patients), grade B (18 patients), and grade C (7 patients) (40). These 26 males and 15 females ranged from 44 to 86 years, and their blood count varied from 9.6 to 189.2 × 103 lymphocytes/ml. Blood was also taken from 10 healthy volunteers and tonsils from 15 children undergoing tonsillectomy. Daudi B cell line cells were purchased from the American Type Culture Collection. The Abs used were obtained from Beckman Coulter, unless specified. Ficoll-Hypaque-separated mononuclear cells from B-CLL patients, healthy volunteers, and patients’ tonsils were treated with a mixture of unconjugated anti-CD3, anti-CD4, anti-CD8, and anti-CD56 mAbs, and the B cells were purified using goat anti-mouse IgG Ab-coated magnetic beads (BioAdvance). This yielded cell populations containing >96% B cells, as shown by PE-anti-CD3 and FITC-anti-CD19 staining. For each patient, 6 wells of 96-well plates (Nunc) were left uncoated and matched with another 6 wells coated with 50 μg/ml sheep F(ab′)2-anti-rabbit F(ab′)2 IgG (Jackson ImmunoResearch Laboratories) overnight at 4°C. All cultures were set at 5 × 105 B cells/well in RPMI 1640 medium supplemented with 10% FCS, 2 mM l-glutamine, and antibiotics. Anti-μ F(ab′)2 (Sigma-Aldrich) at 10 μg/ml final concentration was added to coated wells. After 24 h, the cells were stained with FITC-annexin V (AnV) and propidium iodide (PI) and analyzed by FACS. Cells in the early stages of apoptosis were positive for FITC-AnV and negative for PI. For each patient, each of the 6 coated wells (sIgM-triggered apoptosis) was compared with one of the 6 uncoated wells (spontaneous apoptosis). Significances were determined using the Wilcoxon’s rank-sum test for paired data. When p was >0.05, the sample was interpreted as resistant to sIgM cross-linking, and when p was <0.05, it was interpreted as sensitive. For experiments with inhibitors, cells were preincubated with 1 μg/ml wortmannin (Sigma-Aldrich) or 1 μM bisindolylmaleimide (Calbiochem) in RPMI 1640 medium at 37°C for 1 h before stimulation. Anti-μ-induced apoptosis was confirmed using three other assays that we have described previously in great detail (16, 17, 41, 42): examination of nuclear condensation, measurement of hypoploidy, and DNA fragmentation analysis. Ki-67 staining was used as a measure of cell proliferation 24 h after ligation with anti-μ. Fixed cells were permeabilized with 1 ml of paraformaldehyde/lysine/periodate solution for 15 min at −10°C. After washes, they were incubated with FITC-anti-Ki-67 mAb (DakoCytomation) and analyzed using an EPICS Elite (Beckman Coulter) FACS. Our negative control was an irrelevant FITC-IgG1. PE-anti-CD5, PE-anti-CD79B, or PE-anti-CD38 were combined with FITC-rabbit F(ab′)2, anti-μ (DakoCytomation), and 10,000 events measured/sample. The number of positive cells was compared with isotype controls and that of molecules per cell quantified by the amount of Ab binding to the cell at saturating concentrations, using the Quantum Simply Cellular kit (Flow Cytometry Standards). In selected experiments, the cells were permeabilized with 70% methanol for 1 h, washed, and incubated with unconjugated anti-Zap70 mAb or with control IgG2a. Zap70-containing B cells were revealed with FITC-goat-anti-mouse. An irrelevant FITC-conjugated goat Ab was the negative control. Cells at a concentration of 3 × 106/ml were incubated for 20 min at 37°C with 5 μM fluo-4 acetoxymethyl ester (AME; Molecular Probes), 0.02% pluronic acid, and 4 mM probenecid (Sigma-Aldrich). The cells were maintained at 37°C for 30 min to de-esterificate cellular AME. They were then excited at 488 nm and stimulated with 50 μg/ml biotinylated-anti-μ cross-linked with unconjugated streptavidin (Sigma-Aldrich). The mean fluorescence intensity of fluo-4 AME at 525 nm was calculated. Treatment with 2 μg/ml ionomycin (Sigma-Aldrich) was the positive control. RT-PCR was necessary to discriminate between the TR and the full-length (FL) variant of CD79b (43). B cells from 21 randomly selected patients were evaluated. For the CD79B gene (21), the primers were 5′-GTGACCATGGCCAGGCTGGCGTTGT-3′ (exon 1) and 5′-CCATCCATGTGTGGGGACGGATC-3′ (exon 6). For the GAPDH gene, they were 5′-CTTAGCACCCCTGCCAAGG-3′ and 5′-CTTACTCCTTGGAGGCCATG-3′. DNA fragments of 978 bp for the FL form of CD79B, 602 bp for its TR form, and 542 bp for GAPDH were obtained. PCR amplification consisted of a 4-min denaturing step at 94°C. Reactions were at 94°C for 30 s, 55°C for 60 s, and 72°C for 60 s, with a final 10-min reaction to complete synthesis. We conducted 35 cycles for CD79B and 30 cycles for GAPDH. PCR band densities were assessed using Molecular Analyst Software (Bio-Rad), and the intensities of the signals of CD79B normalized to that of the GAPDH. These results were confirmed using real-time PCR conducted in 10-μl mixtures containing 50 ng of template cDNA, 1× SYBR Green PCR master mix (Applied Biosystems), and 500 nM of each primer. For both isoforms of CD79b, we used 5′-CCTCGCAGCGTCACTATGTCCTC-3′, which is a 3′-primer located in exon 6, combined with one of the two specific 5′-primers: 5′-CGGTACCGGAATCCCAAAGGATTCAG-3′ encompassing exons 3 and 4 of the FL isoform or 5′-CACAGAGCTGCGAGTCATGGGATTCAG-3′ encompassing exons 2 and 4 of the TR isoform. Amplification conditions consisted of one cycle at 50°C for 2 min, one cycle at 95°C for 10 min, followed by 40 cycles at 95°C for 15 s and at 60°C for 1 min. Comparison of cycle thresholds was completed as previously described (44) to evaluate the expression of TR-CD79b, relative to that of FL-CD79b. IgVH genes were sequenced as described previously (45). A mixture of oligonucleotide 5′-primers specific for each leader sequence was used to amplify cDNA from the patients. The PCR products were purified with High Pure PCR Columns (Roche Diagnostic Systems) and analyzed with the Big Dye Terminator Sequencing Reaction kit (Applied Biosystems). Nucleotide sequences were aligned to Basic Local Alignment Search Tool and database of human Ig V region genes. The criteria in assigning membership of the D gene families were seven consecutive nucleotides of identity with no more than two differences. The length of the CDR3 was calculated between codon 95 and codon 102, and sequences exhibiting >2% deviation from a germline IgVH sequence were regarded as mutated. Two aliquots of 1.5 × 107 B-CLL cells were left on ice for 30 min. The first was incubated with 15 μg/ml IgG F(ab′)2-anti-IgM F(ab′)2 cross-linked with 50 μg/ml F(ab′)2-anti-IgG F(ab′)2, and the second was with medium alone. Both were warmed to 37°C for 5 min. The cells were treated for 30 min at 4°C with 1% Triton X-100 in lysis buffer (20 mM Tris-HCl (pH 7.5), 140 mM NaCl, 1 mM EDTA with 1 mM PMSF, 10 μg/ml aprotinin, and 1 mM sodium orthovanadate). The protein concentration of cell lysates was determined by the microbicinchoninic acid protein assay (Pierce), and the proteins were resolved by SDS-PAGE and transferred to PVDF membrane sheets (Bio-Rad). The unbound sites were blocked overnight with 1% gelatin in PBS containing 0.05% Tween 20 and probed with phospho-specific anti-Akt S472/S473, anti-ERK1/ERK2 T202/Y204, anti-p38 T180/Y182 mAbs (BD Pharmingen), goat phospho-specific anti-Zap70 Y292, or rabbit phospho-specific anti-Zap70 Y319 Abs (Santa Cruz Biotechnology). These first-layer Abs were developed with HRP-goat anti-mouse IgG Ab, HRP-donkey anti-goat IgG Ab, or HRP-goat anti-rabbit IgG Ab (all from DakoCytomation) and visualized with an ECL detection system. The protein samples were loaded onto nonlinear (pH 3–10) immobilized pH gradient strips (Bio-Rad) and focused for 30,000 V. These were incubated for 15 min with 5 ml of a first equilibration solution containing 0.375 M Tris-HCl (pH 8.8), 6 M urea, 2% SDS, 35% glycerol, and 70 mM DTT. Then, they were incubated for 30 min with a second equilibration solution, which was identical with the first, except that 135 mM iodoacetamide were substituted for 70 mM DTT. The strips were loaded onto the top of 5–15% acrylamide-bis-acrylamide gradient gels, electrophoresed for 4 h at 30 mA/gel, and transferred to PVDF membranes, which were probed with rabbit anti-phospho-tyrosine Ab and HRP-goat anti-rabbit IgG. Following two-dimensional electrophoresis (2DE), some spots were cut out, and the proteins were sequenced by the Edman degradation method (Centre de Séquençage, Institut des Protéines). In some experiments, the cells were incubated with 10 mM of the cholesterol-sequestering drug methyl-β-cyclodextrin for 30 min at 37°C before they were cultured. The LR were isolated based on their insolubility in nonionic detergents and buoyant density on a sucrose gradient (45). Following a 5-min incubation at 37°C in medium with or without F(ab′)2 anti-μ Ab, two suspensions of 8 × 107 leukemic B cells were washed with 25 mM ice-cold Tris-HCl (pH 7.4), 150 mM NaCl, and 5 mM EDTA (TNE). Both suspensions were then lysed for 30 min on ice in 1% Triton X-100 in TNE buffer with protease inhibitors. One milliliter of each supernatant was mixed with 1 ml of 85% sucrose in TNE and transferred to the bottom of a centrifuge tube. This was overlaid with 3 ml of 35% sucrose and 1.5 ml of 5% sucrose in TNE. The samples were centrifuged in a MLA-80 rotor at 180,000 × g for 17 h at 4°C in a Beckman Optima-Max ultracentrifuge (Beckman Coulter). The insoluble fraction at the interface of 35 and 5% sucrose representing the LR and the 2-ml lysate at the bottom of the tube representing the non-LR membrane fraction were collected. Fractions were resolved by SDS-PAGE, transferred to PVDF membranes, and blotted with biotinylated-anti-GM1 mAb (Sigma-Aldrich), rabbit anti-μ Ab developed with HRP-goat anti-rabbit Ab, anti-Syk (Santa Cruz Biotechnology), or anti-Zap70 mAbs; the latter two were developed with HRP-goat anti-mouse IgG Ab. B cells were incubated for 30 min on ice with Alexa Fluor 594-cholera toxin B (Molecular Probes) to target GM1 to the LR and with FITC-rabbit F(ab′)2 anti-μ. One aliquot of cells was left at 4°C to serve as a control for nonactivation of the BCR, and a second aliquot was warmed to 37°C for 5 min to enable activation through the BCR. Both aliquots were analyzed for double-stained cells with or without sIgM engagement. They were then fixed in 3% paraformaldehyde and centrifuged at 300 × g onto slides. The cytospins were examined using a confocal microscope (Leica Microsystems). Results were expressed as mean ± SEM, and comparisons were made using the χ2 test (with Yates’ correction when required), the paired Wilcoxon’s rank-sum test, and the Mann-Whitney U test for unpaired data. Because we suspected that heterogeneity of the patients might explain the conflicting reports of the B cell fate following sIgM cross-linking, responses to anti-μ were measured in 41 patients. They varied from sample to sample but consistently fell into three patterns, referred to as group I and subgroups IIa and IIb (Fig. 1⇓A). In group I (15 patients), anti-μ had no effect on apoptosis because the percentages of AnV-binding cells following sIgM cross-linking were 18.4 ± 1.8% compared with spontaneous levels of 18.0 ± 1.8%. Influence of sIgM cross-linking on spontaneous apoptosis and proliferation of B-CLL cells. B cells from 41 B-CLL patients were cultured for 24 h in the absence or in the presence of 10 μg/ml F(ab′)2 mouse anti-μ cross-linked with sheep F(ab′)2-anti-mouse IgG F(ab′)2. A, Apoptosis was quantified by binding of FITC-conjugated AnV to PI-negative cells. Two groups of patients were identified: in group I, percentages of AnV-binding cells did not change (15 patients), whereas in group II, sIgM engagement resulted in changes (26 patients). This second group was subdivided into two subgroups: in 7 patients, percentages of AnV-binding cells decreased after sIgM cross-linking (subgroup IIa), whereas cells from 19 patients were sensitive to anti-μ-mediated apoptosis (subgroup IIb). B, Ca2+ mobilization was measured in the leukemic cells of seven patients from each subgroup. B-CLL B cells were loaded with fluorescent indicator fluo-4 AME and analyzed using the FACS, and cross-linked anti-μ was added 150 s after starting the analysis (arrows). Anti-μ Ab induced Ca2+ responses in subgroups IIa and IIb but did not mobilize Ca2+ in group I. That the cells were capable of showing a Ca2+ response was confirmed using ionomycin. Data are presented as the mean of the shift in the fluo-4 AME fluorescence over time. A representative example of group I and subgroups IIa and IIb is shown. C, sIgM engagement induced proliferation of group IIa B CLL cells. This response was measured as the percentage of Ki-67-positive cells by FACS. D, The DNA flow profiles show that B cells are hypoploid in subgroup IIb, but not in group I, and in S phase in subgroup IIa. In group II, there were two opposing changes. 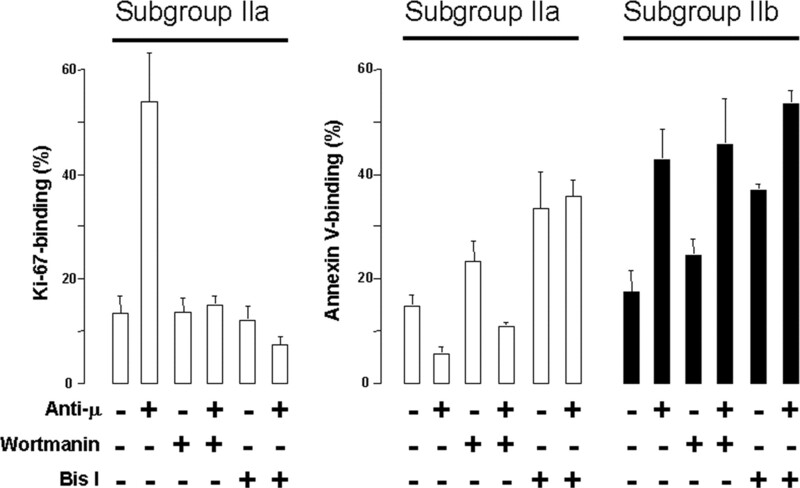 In subgroup IIa (7 patients), the percentages of AnV-binding cells diminished from 18.7 ± 1.8 to 4.3 ± 0.6% (p < 10−4), whereas they augmented from 18.0 ± 1.1 to 40.5 ± 1.5% (p < 10−4) in subgroup IIb (19 patients). Interestingly, the reduction in expression of sIgM was more pronounced in group I than in subgroup IIa before (18.6 ± 3.1 vs 36.9 ± 3.1 × 103 molecules/cell, p < 0.04) but not 24 h after sIgM cross-linking (17.9 ± 3.6 vs 17.8 ± 4.4 × 103 molecules/cell), and than in subgroup IIb before (18.6 ± 3.1 vs 29.4 ± 1.8 × 103 molecules/cell, p < 0.005) and 24 h after sIgM cross-linking (17.9 ± 3.6 vs 42.3 ± 3.5 × 103 molecules/cell, p < 0.01). At time 0, the baseline values of AnV binding were <5% in all samples. The variation of its binding to group I cells, following sIgM cross-linking, was 5.8 ± 2.7% and not different from that of the spontaneous levels. This absence of effect differs from a 76.9 ± 2.4% decrease in subgroup IIa and a 166.5 ± 15.2% increase in subgroup IIb. As shown in previous studies (16, 17), the AnV data were confirmed by nuclear condensation, hypoploidy of the lymphoid cells, and DNA fragmentation in 15 randomly selected patients, of whom 4 patients were categorized in group I, 2 patients in subgroup IIa, and 9 patients in subgroup IIb. To confirm that the BCR pathway was disrupted in group I B-CLL, the induction of Ca2+ flux through sIgM cross-linking (5, 36, 37) was measured in 12 of 15 group I, 7 of 7 subgroup IIa, and 16 of 19 group IIb patients (Fig. 1⇑B). There was no Ca2+ response in the 12 group I patients, although ionomycin mobilized Ca2+ normally. In contrast, an increase in intracellular Ca2+ was seen in subgroups IIa and IIb. It was of interest that these subgroups exhibited differences in Ca2+ flux curves (Fig. 1⇑B). In the seven subgroup IIa samples tested, Ag treatment was able to induce a sustained Ca2+ rise. In the 16 subgroup IIb samples tested, Ca2+ was mobilized rapidly but transiently as seen for tonsillar B cells (14 samples tested) and Daudi B cells. As shown by Ki-67 staining, the anti-μ-induced protection against apoptosis was accounted for by an increased proliferation of the cells in all of the seven subgroup IIa patients (Fig. 1⇑C). There was indeed an increase in the percentage of Ki-67-expressing B cells from 9.9 ± 1.1 to 43.5 ± 4.6% (p < 10−4) on activation through sIgM. In addition, DNA flow profiles for subgroup IIa (Fig. 1⇑D) show that cells from subgroup IIa patients are in S phase. This result correlates to the Ki-67 positivity by 24 h.
The reduction in the rate of apoptosis has been ascribed to several effector molecules. To dissect the mechanisms that result in inhibition of apoptosis, we used reagents to block specific molecules (Fig. 2⇓). Blockade of PI3K with wortmannin in subgroup IIa and subgroup IIb cells prevented activation of Akt and thereby obstructed anti-μ-induced proliferation of subgroup IIa cells, whereas it did not have any apparent influence on antiapoptotic mechanisms of subgroups IIa and IIb cells. This finding is consistent with the results of 2DE where, following BCR engagement, tyrosine-phosphorylated proteins in subgroup IIa (Fig. 3⇓B), but not in subgroup IIb cells (Fig. 3⇓D), were PI3K and Akt. Some spots showed stereotypical localizations, whereas others were identified with certainty by their sequences. Effects of kinase inhibitors on anti-μ-induced apoptosis or proliferation in subgroup IIa and IIb B-CLL cells. Leukemia B cells were incubated with drugs for 1 h before stimulation with F(ab′)2 anti-μ. Apoptosis was quantified by the binding of FITC-AnV to PI-negative cells. Proliferation was measured as the percentage of Ki-67-positive cells. Bis I, Bisindolylmaleimide. 2DE separation and phosphotyrosine pattern of cellular proteins from subgroup IIa and IIb B-CLL patients. Protein lysates were analyzed with a 3- to 10-linear strip in the first dimension and a 5–15% PAGE in the second. The proteins were then blotted and probed with anti-phosphotyrosine Ab. 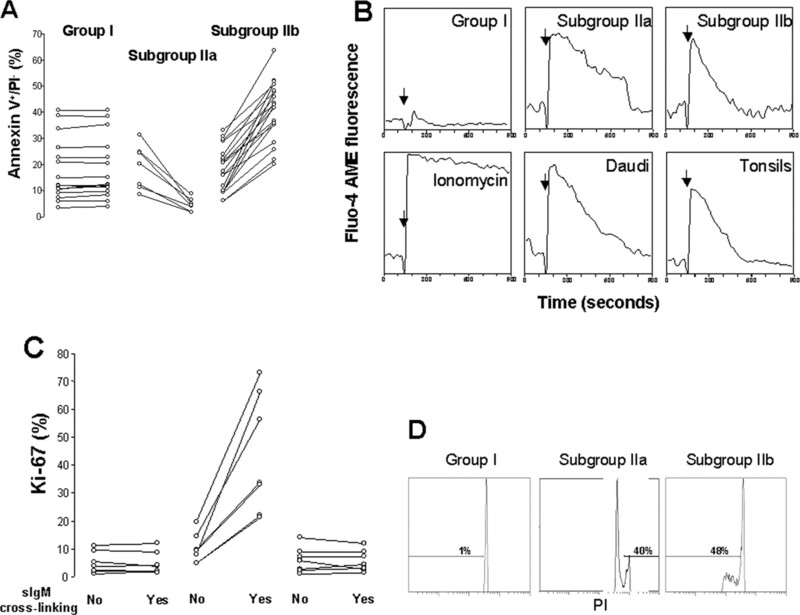 Representative phosphotyrosine patterns of each subgroup without stimulation (A and C) and after 5-min stimulation with cross-linked anti-μ Ab (B and D) are shown. pI, Isoelectric point. Whereas activation of p38 encourages apoptosis, ERK has been shown to be another survival factor (34) regulated in two ways, of which one is dependent on PKC. Inhibition experiments showed that, not only the blockade of PKC with bisindolylmaleimide, which is a potent and selective inhibitor of PKC (46), prevents proliferation (Fig. 2⇑), but this treatment also resulted in sIgM-induced apoptosis in subgroup IIa cells. In contrast, apoptosis was enhanced in subgroup IIb cells. This indicates that ERK is activated in a PKC-dependent manner and that PKC spontaneously exerts its antiapoptotic activity. Changes in different patterns of MAPK activation direct different B cell fates. Again, the results of the inhibition experiments were confirmed by the 2DE profiles. Whereas ERK was tyrosine phosphorylated in subgroup IIa, p38 was not (Fig. 3⇑B). An opposite pattern was obtained in subgroup IIb (Fig. 3⇑D) where p38, but not ERK, was tyrosine phosphorylated. The differing roles of ERK and p38 were confirmed by specific mAbs (Fig. 4⇓B). Tyrosine phosphorylation of ERK was constitutive and additionally increased by sIgM cross-linking in subgroup IIa. In contrast, it was hardly detectable at rest and not increased by sIgM cross-linking in subgroup IIb. On the contrary, p38 became tyrosine phosphorylated in subgroup IIb but not in subgroup IIa. Specific phosphorylation patterns and Zap70 expression triggered by sIgM cross-linking in B-CLL cells from subgroup IIa and IIb patients. A, Cells were permeabilized with 70% methanol for 1 h and incubated with anti-Zap70 mAb (solid histograms) or isotype control (dotted histogram) for 30 min at 4°C. The binding was detected with FITC-goat anti-mouse by FACS. B, Cells were treated with anti-μ for 5 min at 37°C. The protein lysates were separated by 10% PAGE, blotted, and probed with phospho-specific Abs. The BCR threshold is higher for death than for survival (35). Thus, for apoptosis to occur, the signal must be sustained. Given aberrancies in the BCR, Zap70 could be involved in lifting the threshold in B-CLL. Consistent with this notion (Fig. 4⇑A), there were more Zap70+ B cells in 18 subgroup IIb compared with 7 subgroup IIa and 15 group I patients: 66.2 ± 6.8 vs 16.8 ± 8.6%, p < 10−3, and vs 9.2 ± 1.9%, p < 10−4. 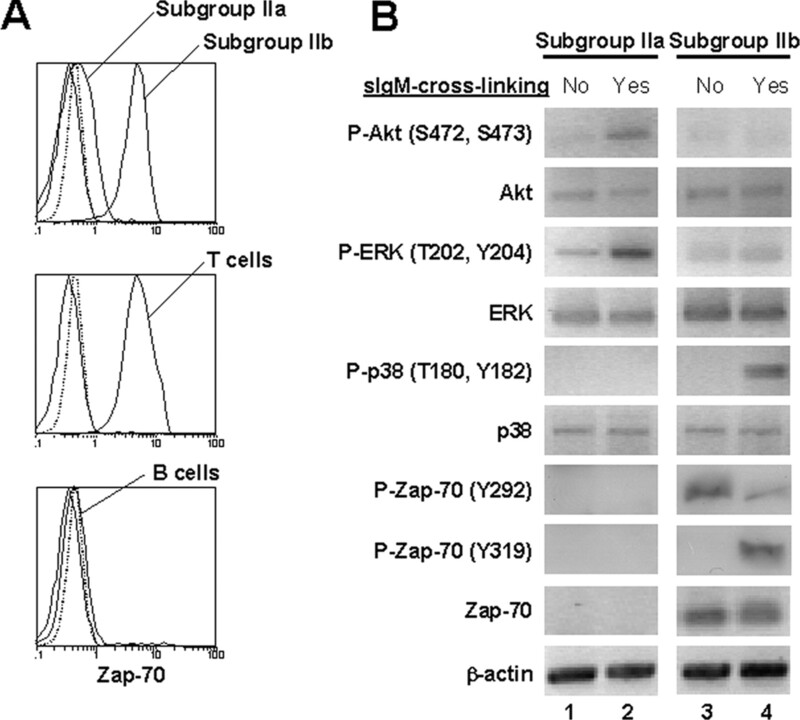 To determine whether Zap70 was functional, lysates of B-CLL cells from seven subgroup IIb cases that contained Zap70 and six subgroup IIa cases that did not were probed with phospho-specific mAbs (Fig. 4⇑B). This confirmed that the expression of Zap70 was restricted to subgroup IIb. Furthermore, in contrast to constitutively autophosphorylated Y292 that exerts a negative effect and is dephosphorylated upon activation, the catalytic site-related Y319 needs cross-linking of sIgM to be phosphorylated. Depletion of cholesterol from the LR with methyl-β-cyclodextrin (Fig. 5⇓A) reduced the percentage of Ki-67-stained cells from 52.4 ± 137 to 18.4 ± 0.7% in six subgroup IIa samples (p < 0.05) and that of AnV-binding cells from 38.2 ± 1.1 to 21.2 ± 1.3% in six subgroup IIb samples tested (p < 0.05). This pilot experiment indicated that the LR were critical for anti-μ-induced proliferation and apoptosis. Whereas BCR did not aggregate into LR (Fig. 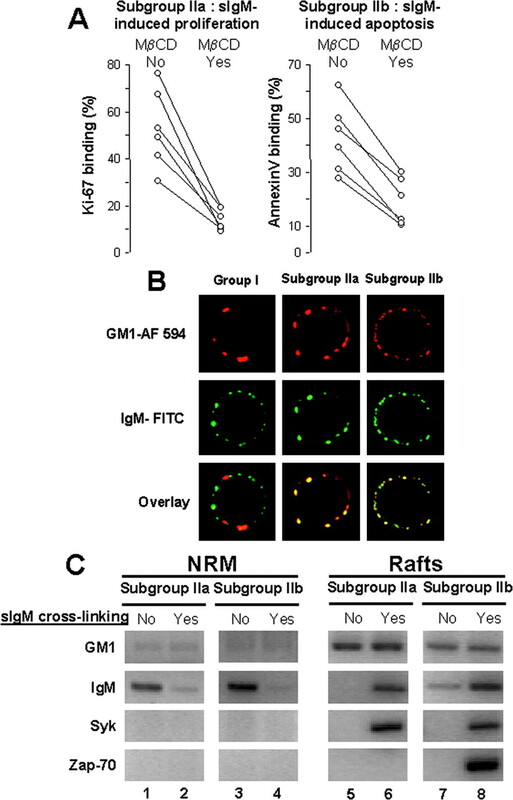 5⇓B, left panel), it was seen that sIgM was located in the LR following cross-linking: overlay of green-stained sIgM with red-stained LR was seen yellow in subgroup IIa (Fig. 5⇓B, middle panel), as well as subgroup IIb cells (Fig. 5⇓B, right panel). Involvement of the LR in signaling mediated through sIgM cross-linking of B cells from group I and subgroups IIa and IIb B-CLL patients. A, Subgroup IIa and IIb cells were treated with 10 mM methyl-β-cyclodextrin (MβCD) for 30 min at 37°C before they were cultured for 24 h with 10 μg/ml F(ab′)2 anti-μ cross-linked with F(ab′)2 anti-F(ab′)2. AnV and Ki-67 staining were measured. B, B cells were incubated with Alexa Fluor (AF) 594-conjugated cholera toxin B, unconjugated F(ab′)2 anti-μ, and FITC-F(ab′)2 anti-F(ab′)2. The localization of red (AF-594) and green (FITC) staining is shown as yellow. C, LR of B cells from 7 subgroup IIa and 15 subgroup IIb patients were isolated, blotted, and probed with anti-GM1, anti-μ, anti-Syk, and anti-Zap70 mAbs. Representative examples are shown. To confirm that Zap70 was involved in BCR signal transduction, we showed that it moved into LR in response to sIgM engagement. LR were isolated in B cells from three subgroup IIa and three subgroup IIb patients, and their position in the sucrose gradient was determined by the presence of GM1 (Fig. 5⇑C). This did not reside in the LR or the non-LR membrane of resting cells but remained in the cytoplasm, as shown later, before BCR cross-linking. Whereas Syk moved into the LR following cross-linking of sIgM in cells from subgroups IIa and IIb, Zap70 was associated with the LR marker in subgroup IIb but not in subgroup IIa. Studies on stimulation through sIgM suggest that the ability or not to signal may parallel prognosis features (13). Hence, we attempted to correlate the differential responses of B cells to anti-μ with four of these features (Table I⇓). CD38 expression is associated with good responses to sIgM cross-linking (38). Therefore, it is not surprising that there were more subgroup IIb than subgroup IIa and group I patients in whom at least 30% of the B cells expressed CD38 (10 of 18 vs 0 of 7, p < 0.04, and vs 2 of 15, p < 0.02). There were also fewer TR-CD79b in subgroup IIa and subgroup IIb than in group I leukemia cells (TR/FL: 0.73 ± 0.04 and 0.77 ± 0.08 vs 1.14 ± 0.12, p < 0.02 and p < 0.02, respectively). These results were confirmed by real-time PCR, which showed more TR-CD79b, relative to FL-CD79b products (1.07 ± 1.55) in group I, and fewer TR-CD79b, relative to FL-CD79b products in subgroup IIa (0.10 ± 0.07) and subgroup IIb (0.03 ± 0.09). The expression of Zap70 was restricted to B cells from subgroup IIb patients. As previously reported (25, 26, 27, 28), this expression paralleled sequencing data from IgVH genes because five of five subgroup IIa, compared with only one of seven group I samples tested, belonged to the unmutated B-CLL group. Finally, these biological characteristics correlated with clinical stages. Indeed, group I consisted of 11 grade A and 4 grade B patients, consisted of subgroup IIa of 2 grade A, 4 grade B, and 1 grade C patients, and subgroup IIb consisted of 3 grade A, 10 grade B, and 6 grade C patients (p < 0.05). Thirty-eight of the 41 patients tested in this study had been investigated previously for CD5-induced apoptosis (16, 17). Therefore, we questioned whether a similar pattern of response was observed with both stimuli. All of the 14 anti-μ group I samples, also tested for anti-CD5, failed to apoptose in response to both anti-μ and anti-CD5 (Table II⇓). The cells from seven subgroup IIa patients proliferated following the engagement of sIgM, although they were unaffected by that of CD5. Fifteen of the 17 subgroup IIb tested underwent apoptosis in response to CD5 or sIgM cross-linking. Thus, cells classified into the different groups in this study showed quite the same responses to two different ligands. This applied only to the apoptotic response because we failed to induce proliferation by cross-linking CD5. These studies were aimed at clarifying the role of sIgM in modulating spontaneous apoptosis in B-CLL cells and correlating differential responses to anti-μ with known prognostic features. The patient population was divided into two broad groups based on resistance (group I) or sensitivity (group II) to anti-μ. Group I comprised 40% of the patients, whereas the remaining 60% consisted of those where proliferation was triggered (subgroup IIa) and those where it was apoptosis (subgroup IIb). It is important to note that the levels of spontaneous apoptosis were similar in group I and subgroups IIa and IIb. That is, the cases with the highest levels of background AnV staining in control medium did not tend to have the highest levels of anti-μ-induced AnV staining. The disruption of signal transduction was confirmed by the absence of BCR-triggered mobilization of Ca2+ in group I samples. One intriguing question is how the same ligand-receptor interaction with sIgM favors proliferation in subgroup IIa, as opposed to apoptosis in subgroup IIb. This helps explain the conflict between reports of the responses to anti-μ of B cells from different B-CLL patients where it was claimed to prolong their survival (5, 6, 13) or to accelerate their apoptosis (8, 9, 10). It is likely that the former population corresponds to our subgroup IIa and the latter to our subgroup IIb. The functional dichotomy seen in group II patients is also consistent with the Ca2+ flux data in that the response was moderate in proliferation and vigorous in apoptosis. The plateau was due to a prolonged release of intracellular Ca2+, rather than a subsequent Ca2+ influx, because the cells were cultured in Ca2+-free medium. Although Ca2+ mobilization profiles similar to ours in B-CLL cells that did or did not proliferate to anti-μ treatment have been described previously (5, 36), these profiles have not been associated previously with proliferation or apoptosis. As an approach to defining differences in responses to BCR engagement in our subgroups, we have focused on some molecules recognized to be key in signal transduction. Differences in the patterns of activated kinases offer an explanation for the described heterogeneity. In this study, investigation with a restricted number of selected kinases distinguished subgroups within the responding B-CLL group II. Constitutive activation of PI3K (6, 29) was confirmed by our finding that its inhibition enabled apoptosis to occur. However, aside from its role in B cell survival, this kinase is involved in their growth, as documented by wortmannin prevention of their anti-μ-induced proliferation. Several molecules, such as Akt, normally prevent apoptosis of B cells. However, Akt, which is an immediate downstream target of PI3K (47), although not phosphorylated in resting B-CLL cells (31, 32), becomes serine phosphorylated following ligation of sIgM and, at least in part, regulates BCR-mediated proliferation. In addition, PI3K can activate novel PKC (33), including PKC δ (32), but this was not addressed in the present work. ERK, which is also activated in the presence of bisindolylmaleimide, may contribute to preventing apoptosis in B-CLL (31). Indeed, its activation, together with inactivation of p38, seems to be critical for survival (5). Thus, the proliferative response of B cells to sIgM cross-linking in subgroup IIa patients is likely to be due to the higher activity of ERK, relative to p38. The opposite situation was seen in subgroup IIb B cells. Engagement of sIgM was a prerequisite for the phosphorylation of PI3K. A greater activity of p38, relative to ERK, encouraged apoptotic responses. Such disturbed regulation may result from a long-lasting activation, as reflected by the extension of Ca2+ fluxes. The outcome of signal transduction through the BCR is determined by its strength and duration. Zap70 might enhance the capacity of the BCR to signal, based on its association with elevated BCR signal transduction in B-CLL (26). We provide additional evidence that Zap70 protein, which undergoes tyrosine phosphorylation and translocates to the LR (48) following sIgM ligation, is functional in subgroup IIb B cells. At this moment, the major challenge is to define reliable markers identifying B-CLL patients at risk of an aggressive outcome. The integrity of the different signaling pathways might help in predicting this outcome. In a separate study, a CD5-induced signal was shown to proceed through CD79B, such as sIgM (17). This could explain, at least in part, the different consequences of incubating B-CLL cells with TGF (49) and anti-Fas-mAb (50). As a corollary, the cells from some B-CLL patients resisted apoptosis, irrespective of the stimulus. This inertness correlated with their inability to mobilize Ca2+. Impaired signaling through the BCR has been associated with low densities of CD38 (8, 9, 10, 11, 12, 13, 38), mutations in the IgVH genes (10, 13, 14, 15, 24, 25), nonexpression of Zap70 (25, 26, 27, 28), and preferential usage of TR-CD79b (16, 17, 21, 43). Other B-CLL cases with more intact BCR-signaling pathways are better able to convey signals for either apoptosis or proliferation. Subgroup IIb cells that apoptose carry high densities of CD38, lack mutations in IgVH genes, express Zap70, and use FL-CD79b preferentially. Interestingly, those patients with poor prognostic features are not present in subgroup IIa, although the signal transduction pathway is functional. Cells from this subgroup do not apoptose but proliferate in response to sIgM ligation. Thus, the same ligand-receptor interaction can promote opposing outcomes of B cell activity, not only on costimulatory signals, such as CD40L and the excess of survivin (51), but also on the differentiation stage the cells have reached. Presumably, the cells from subgroup IIa patients that proliferate are more differentiated than those from the subgroup IIb that apoptose. This is consistent with the fact that the majority of cases of mutated B-CLL fail to signal via sIgM, although their prognosis is better than that of unmutated B-CLL (Ref. 13 ; for review see Ref.52), and with the recent finding (53) that Zap70, which is associated with worse prognosis, enhances sIgM signaling in B-CLL. Therefore, it is not surprising that the prognosis was better in the signal-resisting than in the signal-sensitive group of patients. However, it would be important to evaluate the survival, viz, the response to therapy in the three groups of patients. This study has now been initiated. In conclusion, unresponsiveness mediated by BCR cross-linking defines those patients with indolent B-CLL, whereas the propensity to apoptose (rather than to proliferate) characterizes those with severe disease. Such insights into the BCR transduction pathways may help develop therapeutic agents aimed at interfering with signaling. The technical help of Christelle Le Dantec and the secretarial assistance of Simone Forest and Cindy Séné are appreciated. ↵1 This study was supported by the Académie Nationale Française de Médecine, the Conseil Régional de Bretagne, France, and the Communauté Urbaine de Brest, France. ↵2 S.N. and Y.R. contributed equally to the work. ↵4 Abbreviations used in this paper: B-CLL, B-chronic lymphocytic leukemia; sIgM, surface IgM; TR, truncated; GM1, ganglioside M1; LR, lipid raft; PTK, protein tyrosine kinase; PKC, protein kinase C; AnV, annexin V; PI, propidium iodide; AME, acetoxymethyl ester; FL, full-length; 2DE, two-dimensional electrophoresis. Keating, M. J.. 1999. Chronic lymphocytic leukemia. Semin. Oncol. 26:(Suppl. 14):107. Caligaris-Cappio, F., T. J. Hamblin. 1999. B-cell chronic lymphocytic leukemia: a bird of a different feather. J. Clin. Oncol. 17:399. Chiorazzi, N., M. Ferrarini. 2001. B cell chronic lymphocytic leukemia: lessons learned from studies of the B cell antigen receptor. Annu. Rev. Immunol. 21:841. Kay, N. E., D. F. Jelinek. 2002. B-CLL: is the enigma of disease heterogeneity about to be revealed?. Blood 100:1110. Bernal, A., R. D. Pastore, Z. Asgary, S. A. Keller, E. Cesarman, H. C. Liou, E. J. Schattner. 2001. Survival of leukemic B cells promoted by engagement of the antigen receptor. Blood 98:3050. Hivroz, C., C. Grillot-Courvalin, S. Labaume, J. C. Brouet. 1988. Cross-linking of membrane IgM on B CLL cells: dissociation between intracellular free Ca2+ mobilization and cell proliferation. Eur. J. Immunol. 18:1811. McConkey, D. J., M. Aguilar-Santelises, P. Hartzell, I. Eriksson, H. Mellstedt, S. Orrenius, M. Jondal. 1991. Induction of DNA fragmentation in chronic B-lymphocytic leukemia cells. J. Immunol. 146:1072. Zupo, S., L. Isnardi, M. Megna, R. Massara, F. Malavasi, M. Dono, E. Cosulich, M. Ferrarini. 1996. CD38 expression distinguishes 2 groups of B-chronic lymphocytic leukemias with different responses to anti-IgM antibodies and propensity to apoptosis. Blood 88:1365. Zupo, S., R. Massara, M. Dono, E. Rossi, F. Malavasi, M. E. Cosulich, M. Ferrarini. 2000. Apoptosis of plasma cell differentiation of CD38-positive B-chronic lymphocytic leukemia cells induced by cross-linking of surface IgM or IgD. Blood 95:1199. Damle, R. N., T. Wasil, F. Fais, F. Ghiotto, A. Valetto, S. L. Allen, A. Buchbinder, D. Budman, K. Dittmar, J. Kolitz, et al 1999. Ig V gene mutation status and CD38 expression as novel prognostic indicators in chronic lymphocytic leukemia. Blood 94:1840. Ghia, P., G. Guida, S. Stella, D. Gottardi, M. Geuna, G. Strola, C. Scielzo, F. Caligaris-Cappio. 2003. The pattern of CD38 expression defines a distinct subset of chronic lymphocytic patients at risk of disease progression. Blood 101:1262. Pittner, B. T., D. F. Jelinek, N. E. Kay. 2004. CLL B cells with a bimodal CD38 expression pattern: persistence of bimodal populations despite effective therapy for B-CLL. Leukemia 18:180. Lanham, S., T. Hamblin, D. Oscier, R. Ibbotson, F. Stevenson, G. Packham. 2003. Differential signaling via surface IgM is associated with VH gene mutational status and CD38 expression chronic lymphocytic leukemia. Blood 101:1087. Hamblin, T. J., Z. Davis, A. Gardiner, D. G. Oscier, F. K. Stevenson. 1999. Unmutated immunoglobulin VH genes are associated with a more aggressive form of chronic lymphocytic leukemia. Blood 94:1848. Oppezzo, P., C. Magnac, S. Bianchi, F. Vuillier, A. Tiscornia, G. Dumas, B. Payelle-Brogard, F. Ajchenbaum-Cymbalista, G. Dighiero, O. Pritsch. 2002. Do CLL B cells correspond to naïve or memory B-lymphocytes? Evidence for an active Ig switch unrelated to phenotype expression and Ig mutational patterns in B-CLL cells. Leukemia 16:2438. Pers, J. O., C. Berthou, N. Porakishvili, M. Burdjanadze, G. Le Calvez, J. F. Abgrall, P. M. Lydyard, P. Youinou, C. Jamin. 2002. CD5-induced apoptosis of B cells in some patients with chronic lymphocytic leukemia. Leukemia 16:44. Renaudineau, Y., S. Nédellec, C. Berthou, P. M. Lydyard, P. Youinou, J. O. Pers. 2005. Role of B cell antigen receptor-associated molecules and lipid rafts in CD5-induced apoptosis of B CLL cells. Leukemia. 19:223. Cioca, D. P., K. Kitano. 2002. Apoptosis induction by hypercross-linking of the surface antigen CD5 with anti-CD5 monoclonal antibodies in B cell chronic lymphocytic leukemia. Leukemia 16:335. Zomas, A. P., E. Matutes, R. Morilla, K. Owusu-Ankomah, B. K. Seon, D. Catovsky. 1996. Expression of immunoglobulin-associated proteins in B cell disorders with the monoclonal antibody SN8 (CD79B). Leukemia 10:1966. Thompson, A. A., J. A. Talley, H. N. Do, H. L. Kagan, L. Kunkel, J. Berenson, M. D. Cooper, A. Saxon, R. Wall. 1997. Aberrations of the B-cell receptor B29 gene in chronic lymphocytic leukemia. Blood 90:1387. Alfarano, A., S. Indraccalo, P. Circosta, S. Minuzzo, A. Vallario, R. Zamarchi, A. Fregonese, F. Calderazzo, A. Faldella, M. Aragno, et al 1999. Alternatively spliced form of CD79B may account for altered B-cell receptor expression in B-chronic lymphocytic leukemia. Blood 93:2327. Alfarano, A., P. Circosta, A. Vallario, C. Camaschella, S. Indraccolo, A. Amadori, F. Caligaris-Cappio. 1999. Alternative splicing of CD79A (Igα) and CD79B (Igβ) transcripts in B-CLL cells. Curr. Top. Microbiol. Immunol. 246:241. Pierce, S. K.. 2002. Lipid rafts and B-cell activation. Nat. Rev. Immunol. 2:96. Klein, U., Y. Tu, G. A. Stolovitzky, M. Mattioli, G. Cattoretti, H. Husson, A. Freedman, G. Inghirami, L. Cro, L. Baldini, et al 2001. Gene expression profiling of B cell chronic lymphocytic leukemia reveals a homogeneous phenotype related to memory B cells. J. Exp. Med. 194:1625. Rosenwald, A., A. A. Alizadeh, G. Widhopf, R. Simon, R. E. Davis, X. Yu, L. Yang, O. K. Pickeral, L. Z. Rassenti, J. Powell, et al 2001. Relation of gene expression phenotype to immunoglobulin genotype in B chronic lymphocytic leukemia. J. Exp. Med. 194:1639. Chen, L., G. Widhopf, L. Huynh, L. Rassenti, K. R. Rai, A. Weiss, T. Kipps. 2002. Expression of Zap-70 is associated with increased B-cell receptor signaling in chronic lymphocytic leukemia. Blood 100:4609. Dürig, J., H. Nückel, M. Cremer, A. Fuhrer, K. Halfmeyer, J. Fandrey, T. Moroy, L. Klein-Hitpass, U. Duhrsen. 2003. Zap-70 expression is a prognostic factor in chronic lymphocytic leukemia. Leukemia 17:2426. Wiestner, A., A. Rosenwald, T. S. Barry, G. Wright, R. E. Davis, S. Henrickson, H. Zhao, R. E. Ibbotson, J. A. Orchard, Z. Davis, et al 2003. ZAP-70 expression identifies a chronic lymphocytic leukemia subtype with unmutated immunoglobulin genes, inferior clinical outcome, and distinct gene expression profile. Blood 101:4944. Yao, R., G. M. Cooper. 1995. Requirement for phosphatidylinositol-3 kinase in the prevention of apoptosis by nerve growth factor. Science 267:2003. Datta, S. R., A. Brunet, M. E. Greenberg. 1999. Cellular survival: a play in 3 Akts. Genes Dev. 13:2905. Barragán, M., B. Bellosillo, C. Campàs, D. Colomer, G. Pons, J. Gil. 2002. Involvement of protein kinase C and phosphatidylinositol 3-kinase pathways in the survival of B-cell chronic lymphocytic leukemia cells. Blood 9:2969. Ringshausen, I., F. Schneller, C. Bogner, S. Hipp, J. Duyster, C. Peschel, T. Decker. 2002. Constitutively activated phosphatidyinositol-3′ kinase (PI-3K) is involved in the defect of apoptosis in B-CLL: association with protein kinase Cδ. Blood 100:3741. Toker, A., M. Meyer, K. K. Reddy, J. R. Falck, R. Aneja, S. Aneja, A. Parra, D. J. Burns, L. M. Ballas, L. C. Cantley. 1994. Activation of protein kinase C family members by the novel polyphosphoinositides PtdIns-3,4-P2 and PtdIns-3,4,5-P3. J. Biol. Chem. 69:32358. Xia, Z., M. Keckens, J. Raingeaud, R. J. Davis, M. E. Greenberg. 1995. Opposing effects of ERK and JNK-p38 MAP kinases on apoptosis. Science 270:1326. Healy, J. I., C. C. Goodnow. 1998. Positive versus negative signaling by lymphocyte antigen receptors. Annu. Rev. Immunol. 16:645. Michel, F., H. Merle-Béral, E. Legac, A. Michel, P. Debré, G. Bismuth. 1993. Defective calcium response in B-chronic lymphocytic leukemia cells: alteration of early protein tyrosine phosphorylation and of the mechanism responsible for cell calcium influx. J. Immunol. 150:3624. Lankester, A. C., G. M. van Schijndel, C. E. van der Schoot, M. H. van Oers, C. J. van Noesel, R. A. van Lier. Antigen receptor nonresponsiveness in chronic lymphocytic leukemia B cells. Blood 86:1090. Deaglio, S., A. Capobianco, L. Bergui, J. Durig, F. Morabito, U. Duhrsen, F. Malavasi. 2003. CD38 is a signaling molecule in B-cell chronic lymphocytic leukemia cells. Blood 102:2146. Matutes, E., D. Catovsky. 1994. The value of scoring systems for the diagnosis of biphenotypic leukemias and mature B-cell disorders. Leuk. Lymphoma 13:11. Binet, J. L., A. Auquier, G. Dighiero, C. Chastang, H. Piguet, J. Goasguen, G. Vaugier, G. Potron, P. Colona, F. Oberling, et al 1981. A new prognostic classification of chronic lymphocytic leukemia derived from a multivariate survival analysis. Cancer 48:198. Pers, J. O., C. Jamin, R. Le Corre, P. M. Lydyard, P. Youinou. 1998. Ligation on resting B cells results in apoptosis. Eur. J. Immunol. 28:4170. Bordron, A., M. Dueymes, Y. Levy, C. Jamin, J. P. Leroy, J. C. Piette, Y. Shoenfeld, P. Youinou. 1998. The binding of human antiendothelial all antibodies induces endothelial cell apoptosis. J. Clin. Invest. 101:2029. Cragg, M. S., H. T. Chan, M. D. Fox, A. Tutt, A. Smith, D. G. Oscier, T. J. Hamblin, M. J. Glennie. 2002. The alternative transcript of CD79B is overexpressed in B-CLL and inhibits signaling. Blood 100:3068. Livak, K. J., T. D. Schmittgen. 2001. Analysis of relative gene expression data using real-time quantitative PCR and the 2−ΔΔCt method. Methods 25:402. Fais, F., F. Ghiotto, S. Hashimoto, B. Sellars, A. Valetto, S. L. Allen, P. Schulman, V. P. Vinciguerra, K. Rai, L. Z. Rassenti, et al 1998. Chronic lymphocytic leukemia B cells express restricted sets of mutated and unmutated antigen receptors. J. Clin. Invest. 102:1515. Toullec, D., P. Pianetti, H. Coste, P. Bellevergue, T. Grand-Perret, M. Ajakane, V. Baudet, P. Baissin, E. Boursier, F. Loriolle, et al 1991. The bisindolylmaleimide GF 109203X is a potent and selective inhibitor of protein kinase C. J. Biol. Chem. 266:15771. Gold, M. R., M. P. Scheid, L. Santos, M. Dang-Lawson, R. A. Roth, L. Matsuuchi, V. Duronio, D. L. Krebs. 1999. The B cell antigen receptor activates the Akt (protein kinase B)/glycogen synthase kinase-3 signaling pathway via phosphatidylinositol 3-kinase. J. Immunol. 163:1894. Aman, M. J., K. S. Ravichandran. 2000. A requirement for lipid rafts in B cell receptor-induced Ca2+ flux. Curr. Biol. 10:393. Douglas, R. S., R. J. Capocasale, R. J. Lamb, P. C. Nowell, J. S. Moore. 1997. Chronic lymphocytic leukemia B cells are resistant to the apoptotic effects of transforming growth factor-β. Blood 89:941. Panayiotidis, P., K. Ganeshaguru, L. Foroni, A. V. Hoffbrand. 1995. Expression and function of the Fas antigen in B chronic lymphocytic leukemia and hairy cell leukemia. Leukemia 9:1227. Granziero, L., P. Ghia, P. Circosta, D. Gottardi, G. Strola, M. Geuna, L. Montagna, P. Piccoli, M. Chilosi, F. Caligaris-Cappio. 2001. Survivin is expressed on CD40 stimulation and interfaces proliferation and apoptosis in B-chronic lymphocytic leukemia. Blood 97:2777. Stevenson, F. K., F. Caligaris-Cappio. 2004. Chronic lymphocytic leukemia: revelations from the B-cell receptor. Blood 103:4389. Chen, L., J. Apgar, L. Huynh, F. Dicker, T. Giago-McGahan, L. Rassenti, A. Weiss, and T.J. Kipps. ZAP-70 directly enhances IgM signaling in chronic lymphocytic leukemia. Blood. In press.